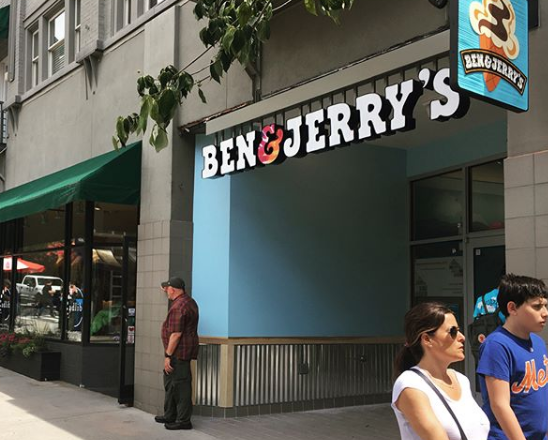 Ben Cohen and Jerry Greenfield, the founders of Ben & Jerry’s ice cream shops, will be scooping ice cream from noon to 1 p.m. on Saturday at the new Ben & Jerry’s shop at 19 Haywood St. in downtown. The downtown Asheville location opened last September, but the Saturday, Feb. 9, event will be the grand opening celebration. Shakes, sundaes and ice cream flavors like Phish Food and Chocolate Chip Cookie Dough will be on the menu, along with Ben and Jerry. Cohen and Greenfield, who have been childhood friends since grade school, took their Vermont-based ice cream company with a social conscious public in 1984. In 2000, they agreed to be acquired by Unilever. The deal, for an estimated $326 million, made Ben & Jerry’s Homemade a wholly owned subsidiary of Unilever with a separate board that included Cohen and Greenfield, the New York Times reported at the time. Saturday’s event will partner with the local nonprofit Girls On The Run, with tips donated. Girls on the Run empowers girls to recognize their inner strength and celebrate what makes them one of a kind. Free scoops will go until 4 p.m. After 4 p.m., there will be a 20 percent discount on purchases. Any reaction from the downtown chain police?